The Government of Chile has just held its largest ever electric power auction that resulted in a significant reduction of electricity prices. Non-Conventional Renewable Energy Sources played a major role at the auction, to which over half of the energy that was opened to tender was awarded, and that are vital in the Energy Agenda of the Andean country. The highly anticipated energy mega-tender by the Chilean Government that was held last August surpassed all expectations. Moreover, this electric power auction of approximately 12,500 GWh for period 2021-204, has attracted great media interest both at a national and international level, which is mainly due to the low prices that were reached and the participation of renewable energies. “The average price per megawatt/hour auctioned was 47.6 USD. Notably, the average price per megawatt/hour auctioned was US$47.60, which is half the selling price of two and a half years ago and well below the tender price in December, when renewables also came out as winners. 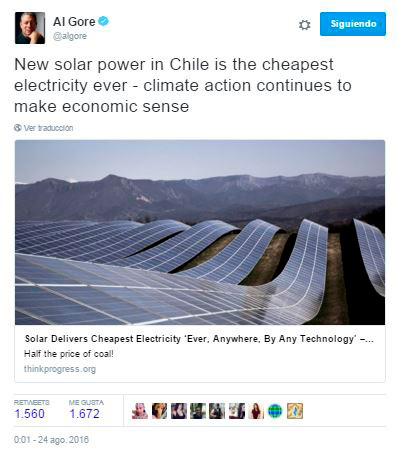 This figure has been commented on worldwide, and was even mentioned by Al Gore, the former Vice-President of the United States,on his twittter account, where he commented a few days ago that the “New solar power in Chile is the cheapest electricity ever.” US$29.10 MWh/h was the minimum tendered price awarded to a solar energy company. In the market, several analysts have described the auction as the start of a new shaping of the industry, but it could also affect the sector’s long-term profitability. The high participation in the process was another milestone with a total of 84 national and foreign companies involved. According to the Ministry of Energy, the result of the auction will allow electricity bills to be reduced from the year 2021. It is of note that the figure auctioned is equivalent to one third of total consumption by clients that are regulated by the SIC (Central Interconnected System) and SING (Norte Grande Interconnected System). “Chile’s Energy Agenda has set the objective that renewable energy will make up 20% of the grid by 2025. The tender forms part of the Energy Agenda that Michelle Bachelet’s Government has outlined up to the year 2025. Among other points, it promotes the appearance of new players in the search for increased competition in the electric sector,and strives to increase the share of Non-Conventional Renewable Energy sources to make up 20% of the grid within that period. 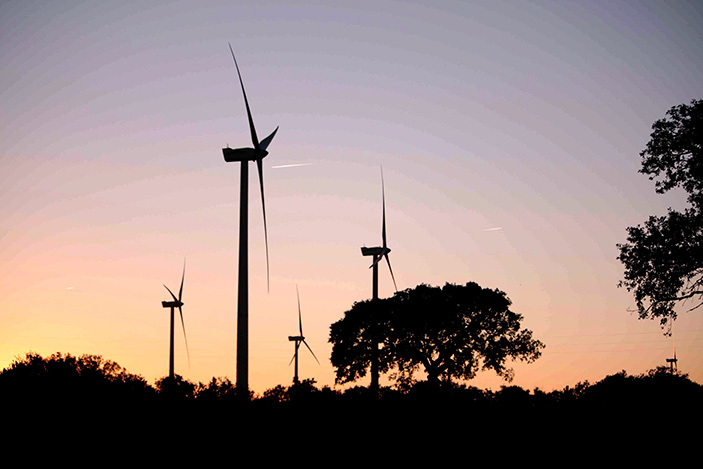 Chile’s renewable sector is even more ambitious in that regard and believes that a 100% renewable electrical power grid will be possible by around the year 2050, according to projections by the Chilean Association of Renewable Energy (Acera). Mª José López Arancibia, Communication Manager Abengoa Chile.